During the construction of the subterranean tunnel of the METRO and to ensure the safe passage of the large drill used, a pilot tunnel was dug. Starting at the ACROPOLIS Station it divided into two sections which were approximately 300 metres long each and headed north and south respectively. The work was executed by conventional means and under archaeological supervision. On their route, the conventional digging machines came across various ancient cavities, originally wells or cisterns, whose filling material tumbled onto the tunnel floor as soon as it was disrupted. In antiquity, after the cavities had stopped being used, they became a dumping ground for useless everyday objects, which probably originated from the clearing of surrounding areas. One such cavity is Well no. 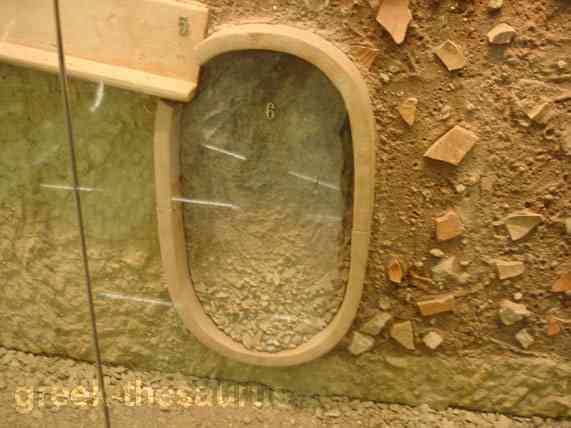 68, which is depicted here immediately after it was located, when its material had already fallen into the tunnel. It contained a great number of pots, intact or in pieces, primarily of the Byzantine era. One hundred and thirty three almost intact pots were gathered, (stamnia, laginoi, phlaskia, amphorae, oinochoes), as well as hundreds of sherds from other clay pots, small bone objects, fragments of sculpture and of architectural members. Additionally, loom weights, pieces of oil lamps, bones, shells etc. were found. All the finds from Well 68, as well as those from the other cavities, were collected by the archaeologists of the excavation and catalogued. Having undergone cleaning and conservation, they are now housed at the archaeological store-rooms of the A' Ephoreia of Antiquities, from whose photographic archive this illustration has been taken. Ancient large central sewer from the excavation of the Acropolis metro.